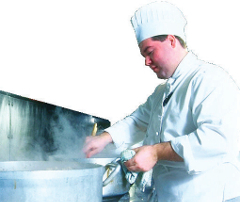 Hot summer weather can cause dangerous conditions for people who work in places such as bakeries, foundries, restaurant kitchens, laundries and pulp mills. A combination of high outdoor temperatures with heat build-up inside can be fatal. The following is a reminder for workers and employers of the regulations relevant to heat stress. These regulations are part of the Occupational Health and Safety (OHS) Act’s General Regulation (Reg.) 91-191. Minimize exposures to recognized hazards. Provide instruction and protective equipment. Monitor the situation by using measuring instruments [Paragraphs 22(a)(b), Reg. 91-191]. Train workers to recognize the symptoms of heat stress and what to do if it occurs [Subsection 23(1), Reg. 91-191]. Make sure an adequate supply of fresh drinking water is available and that workers have frequent access to it. Ensure their own health and safety. Report the existence of any hazard to the employer. Wear or use protective equipment when needed. Follow instructions and/or guidelines established to minimize any known workplace risk or hazard. You owe it to yourself and your co-workers to recognize the signs of heat stress and to know the proper first aid measures. Everyone should learn to take a few simple precautions to prevent heat cramps, heat exhaustion and heat stroke from happening in the first place. When working in hot conditions, your body can lose up to one litre of fluid per hour. Don’t rely on thirst to tell you when or how much to drink. Drink large quantities of fluids before you begin to work and about one cup every 20 minutes while you work. The best fluid to drink is water, or liquids with some sodium content. Don’t drink any form of alcohol – it causes your body to lose fluids. The salt in most prepared foods should be sufficient, but if you’re working in extreme conditions, drink liquids with some sodium content, or try an electrolyte replacement drink. Wear light-coloured, loose-fitting clothing that doesn’t leave too much skin exposed. Wear a hat in the sun. Start by working slowly and taking short, frequent breaks. Gradually increase the frequency, intensity, or duration of your tasks as your comfort level improves. Some workers reach full acclimatization within a week. Others take longer, depending on their size, stamina, and the type of work they’re doing. Heat cramps – painful muscle spasms and excessive sweating. Heat exhaustion – headache, dizziness, weakness, nausea and clammy skin. Heat stroke – severe headache, confusion, delirium, convulsions, loss of consciousness and hot, dry, flushed skin.